Robert was employed with P.B. Gravely & Co., a well-known local tobacco firm. I’m not sure what exactly his position with the company was even though the B&B reported him as a clerk. 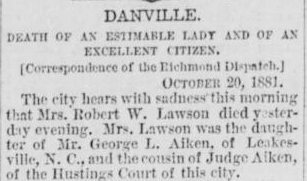 Whatever his duties were, they allowed him to afford a mansion alongside many other prominent Danville families on Main Street. Robert married Elizabeth “Bettie” Aiken on April 30, 1861. She died in October 1881, which is around the time that the house was built. I don’t know if she ever lived there or not. When I originally posted this, I hadn’t been able to find any record of the couple having any children on Ancestry. 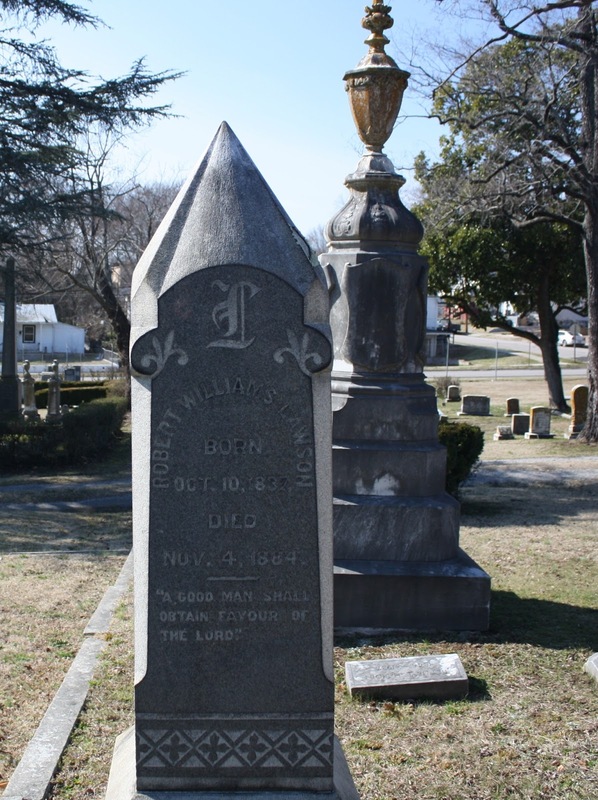 But when I read that his wife went by the name “Bettie,” I remember reading “Bettie Aiken” on a child’s tombstone during one of my many trips to Green Hill. I checked and Robert and Bettie did have at least one daughter, Bettie Aiken Lawson, who lived from June 1871 until March 1872. This prompted me to begin searching for additional children that hadn’t shown up in previous results. I found a death certificate for Ben Lawson listing R.W. Lawson and Bettie Aiken as his parents. 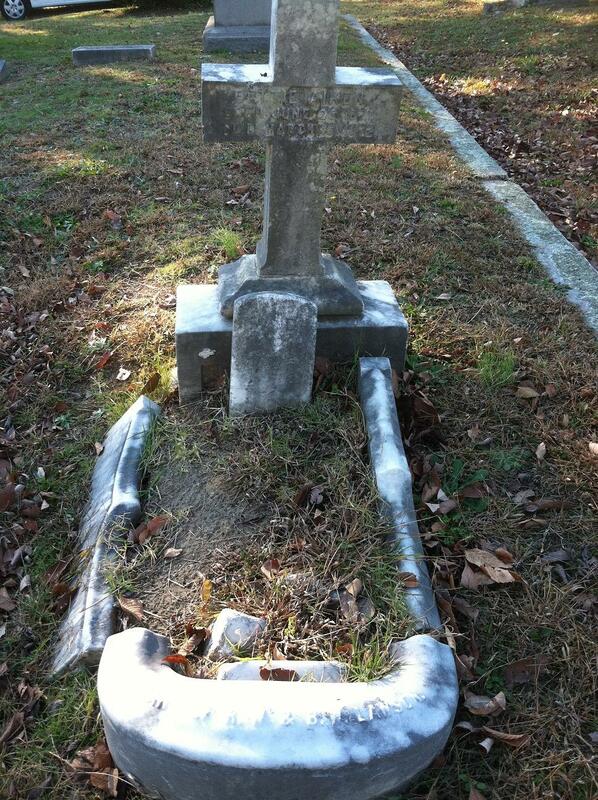 Ben was born in 1869 in Danville, Virginia and died in 1925 in Burlington, North Carolina. Robert’s death notice gives a few details about the day that he died. Perhaps I’ve been spending too much time in the archives researching bizarre deaths, suicides, and murders, but there are a few things here that “bug” me. 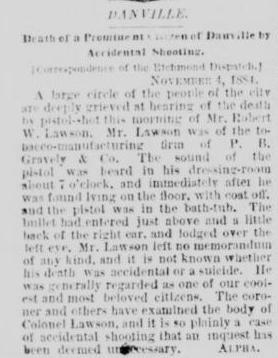 Early in the article the writer suggested that it was unclear whether the shooting was a suicide or accidental, but then states that there would be no coroner’s inquest because his death was obviously an accident. Was this determination based on the absence of a suicide note or Lawson’s high standing in the community? I’ve tried to imagine a scenario in which he could’ve accidentally shot himself, with an entry wound just behind and above his right ear, with the bullet stopping over the left eye. Is the fact that his coat was off significant at all to the shooting? Even if the gun went off while he was disrobing, that’s still an odd way to hold a gun and take off a jacket. Of course if my research of historic deaths has taught me nothing else, it’s that The Reaper often employs seemingly impossible possible methods when harvesting. Update: After my initial posting of this entry the owners of the bed and breakfast allowed me to tour the home. The interior was beautiful, but I was unable to visually recreate the scene because they didn’t know which room was Mr. Lawson’s bedroom or dressing room. I agree… His death seems suspicious to me! Just try to line up your hand to go right side to left eye….. oy!